Kudumbashree, the flagship poverty eradication programme of Kerala government was launched in the year 1998 in urban Alappuzha and in rural Malappuram under the aegis of Government of Kerala to scale up the strategy to the entire state. This was to be introduced through concentrated community action with the support of the Local Self Governments (LSGs) that would facilitate convergence of the available schemes and resources to tackle the multiple dimensions and manifestations of poverty holistically. For this purpose, Kudumbashree with the support of the LSGs facilitated the building of Community-Based Organisations (CBOs) of women across the state. Today, with the participation of more than 41 lakh women; Kudumbashree is the biggest CBO in Asia. The primary aim of Kudumbashree was to eradicate poverty in the state by the year 2008.Women were recognised as the most suitable drivers for bringing about poverty eradication. Even though women emancipation was an unintended consequence, Kudumbashree ensured one of the most successful examples in independent India of women empowerment along with the elimination of poverty. The 73rd and the 74th amendment of the Indian constitution coupled with the Kerala specific legislation in 1994 were crucial for the effective decentralisation process of Kerala. Kerala initiated a process which probably no other state in India would have implemented. People were involved in the consultation, identification of problems and development of effective solutions at the local level. The state government set aside nearly 40% of the planned fund for the panchayat bodies. This required each panchayat preparing detailed plans for the devolution of the funds. They were also encouraged to enhance the collection of own revenue, which had been an important source of income for panchayats in Kerala even before the decentralisation process (Kannan and Jagajeevan, 2013). The people’s plan campaign was probably the single largest experiment in local democracy strengthening people’s voices and giving them a role to play in the decision that affects them. This process directly impacted the lives of nearly 31 million people across the state. It led to the emergence of several landmark mass programmes and certainly Kudumbashree being the most important one of them. Practices such as Pidiyari sambadhyam, Kuri Kalyanam, Weekly chit funds, Kettu Thengu project etc. are examples of traditional saving schemes that existed in Kerala wherein a mutual support system existed to help each other in cash and kind was an inspirational idea for the setting up of Kudumbashree in the state. Two important initiatives under the PPC, firstly, the creation of Women Component Fund under the Gram Panchayats and secondly, the idea of making women Neighbourhood Groups, an important tool for better functioning of Gram Sabhas- both strengthened the thoughts on the emergence of the Kudumbashree project in Kerala. There are several programs which provided the background for the thought process of introducing a model like Kudumbashree for poverty eradication in Kerala. 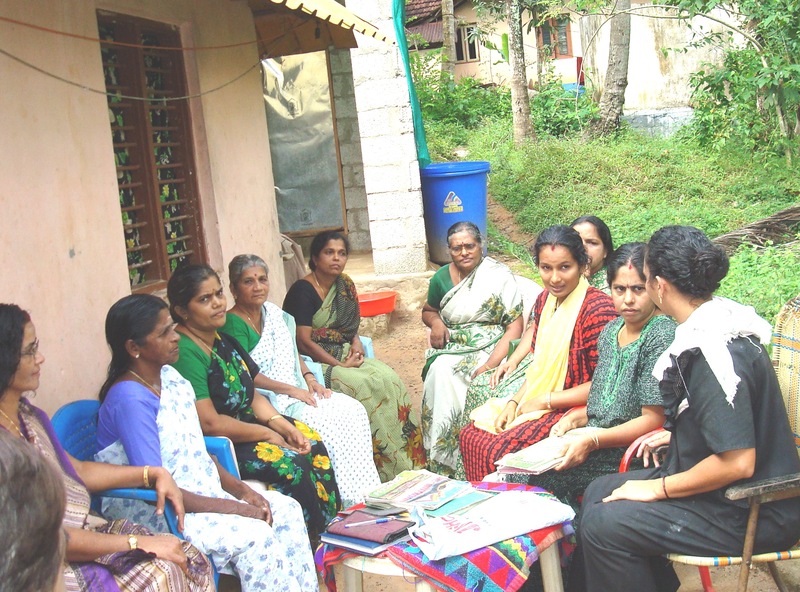 The Urban Poverty Alleviation Programme implemented in Alappuzha municipality in 1992 – 93 formed NHGs of women in seven wards, formed a Community Development Society (CDS) and started functioning as a CBO network. This model spread across all 36 wards in the Alappuzha municipality by 1993 – 94. This model was then adopted by all the Panchayats in Malappuram district in 1994. By 1995, this model was adopted by 58 municipalities across Kerala. In 1995 – 96, the Kerala Municipalities’ Act was amended to include that two per cent of the municipalities own fund would be kept aside for poverty eradication activities. In 1994, apart from the Poverty Alleviation Project, Malappuram district had also implemented the CBNP project with the assistance from UNICEF under which 4000 plus NHGs were formed. It was registered as a State Poverty Eradication Mission in November 1998 and it became functional in April 1999. Kudumbashree developed an innovative methodology to identify the poor using non-economic parameters. The poor thus identified are organised under a well networked Community Based Organization (CBO). 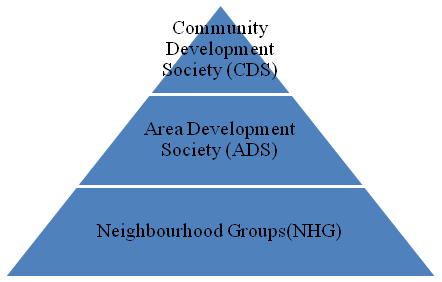 The second tier is the Area Development Society, which is formed at ward level by federating all the NHGs in the ward. The activities of the ADS are decided by the representatives of the women elected from various NHGs. ADS consists of a General body which consists of the 5 representatives from every NHG in the ward. From the general body, an executive committee consisting of 7 members is elected and this includes the chairperson, vice-chairperson and a secretary. At the Panchayat / Municipal level, a Community Development Society (CDS), a registered body under the Travancore-Cochin Literacy Scientific and Charitable Societies Act is formed by federating all ADSs in the Panchayats. The CDS is constituted by a General Body which consists of all ADS Governing Body members. Further, an Executive Committee is selected through elections and consists of representatives of each ADS. From the CDS executive committee, a chairperson and a vice chairperson are elected. The chairperson is the highest office bearer of Kudumbashree in a panchayat. The elections to the three-tier structure of Kudumbashree concluded on the 25th, January 2015 immediately after the start of my internship. Even though Kudumbashree came into existence in 1998, the elections to the three-tier structure lacked uniformity and there was a clear political intervention for obtaining the top positions in the organisation. Elections to the NHGs was often presided by the panchayat ward members. The president, the secretary and the other volunteers were decided based on the preference of the panchayat representatives. Often importance was given to members with education. This essentially meant that everyone in an NHG unit didn’t have an equal chance of becoming an office-bearer. When the volunteers weren’t nominated by the members themselves, the democratic character of the elections was lost. The existence of the three-tier structure was also not uniform. For instance, in some panchayats, the CDS, ADS and the NHG existed for 1 year and in others for 2 years etc. before 2008. Positions to the top office namely the election of the CDS chairperson and the vice chairperson was undertaken under political considerations. The CDS office more often than not lacked autonomy through the constant intervention of the panchayat officials. Panchayat officials being elected directly by the people considered themselves superior to the CDS office bearers and constantly subjugated them. The CDS bye-law which came into existence in 2008 rejuvenated the election process by regaining the confidence of women and gave a new life to Kudumbashree. I was assigned with the task of evaluating the entire election process after the initiation of the CDS bye-law in 2008 and also to study how the initiation of democratic elections into a poverty eradication policy is capable of altering the social-democratic capabilities of women. For the purpose of the study, I was expected to undertake both desk research as well as field work. The desk research was mainly to understand the election to the three-tier structure before 2008 and how it has changed with the initiation of the bye-law. I also conducted discussions and interviews with several people who have been working within the fold of Kudumbashree to understand how the election process has changed over the years. For my field work, I was assigned to evaluate the election process of the panchayat of Pandalam Thekkekara in the Pathanamthitta district of Kerala for a span of one week. During this process, I attempted to study the election process to all the three structures. For this purpose, detailed interviews were conducted with several NHG units, office bearers of ADS and CDS. In the course of my interaction with women, the focus was on understanding how after assuming roles of leadership through the election process their capabilities have been altered. Attempts were also made to understand if the election process was transparent and if there was any kind of political influence during the conduct of these elections. Kudumbashree made a relatively late arrival to the panchayat of Pandalam Thekkekara in the year 2002. But it has undoubtedly transformed the lives of women and the way a male-dominated society perceived them. It has been a long journey in transforming a society wherein women were meant to be within the four walls of their houses to a time where women are holding positions of power and are involved in all the major decision-making process of the panchayat. Kudumbashree has undoubtedly played a pivotal role in altering the lives of millions of women. The success of Kudumbashree lies in making women partners in the democratic process. For many a journey from a normal member to an office bearer has greatly transformed their lives both personally and their stature in the society. Women in this panchayat clearly recall how men in the house detested the idea of their womenfolk joining Kudumbashree and sitting in a circle of other 10-20 women. For men, Kudumbashree in its initial phase was just a gathering of a set of women from the neighbourhood sitting and gossiping and coming together for no constructive purpose. But the initial success of Kudumbashree started changing the tide of things when men pushed their women to get out of the houses and become a part of the neighbourhood groups. By becoming a part of the Kudumbashree network women now had their own set of savings which could be put forth along with the income of the men in the house. With ready availability of loans which could be repaid at minimal interest rates, Kudumbashree clearly ensured greater financial independence for women and relieved them from constantly demanding money from men for every small need of the household. Most women in the panchayat proudly claim about handling all the expenses incurred for the kids in the beginning of an academic year. All major expenses right from the purchase of uniforms, books etc. are completely handled from the savings a woman gathers from Kudumbashree. With the initiation of MGNREGA, this process has become more enhanced. Most women recount a time when they didn’t even know how to withdraw money from the banks and had to go in a group of 3 or 4 for any bank transaction. Now every woman has a bank account of her own by being in the fold of Kudumbashree and later in MGNREGA.For many signing a cheque on their own has now become a sign of empowerment. Being involved in Kudumbashree has brought in significant changes in the way women were perceived in the society. Not only have women been economically empowered but she has also been socially strengthened. Activities are not limited merely to a weekly collection of money and internal lending or setting up of micro enterprises. With the involvement in Kudumbashree, complete development of women has been ensured. Right from the weekly discussions of the happenings in the society to the regular training and classes has successfully opened up new horizons for women. Things which seemed completely inaccessible now seem to have become an integral part of their lives. This is true with women assuming roles of leadership within the NHG units and the structure upwards. The office bearers of the three tiers have now become involved in the entire decision-making process of the panchayat. We see a scenario wherein they sit along with the Panchayat representatives and pose questions, seek clarifications and put forth their suggestions. Assuming roles of leadership within the three tier structure of the Kudumbashree has instilled the confidence and have given them space which was purely dominated by men till more recently. Many of them after assuming various roles of leadership within the fold of Kudumbashree have joined active politics and have gone on to contest elections for the post of panchayat presidents or the MLA etc.